Katie Korgaokar was 36 years old when she had her hip replaced. The ball of Korgaokar's ball and socket was shaped like an arrow from Perthes disease -- a childhood condition that blocked the femur's blood supply during her development. "They had this new, latest greatest hip out there that was going to be perfect for a woman that was smaller," said Korgaokar, who initially hesitated to sign up for such a major procedure. "So I said, whatever you think is best is what we're going to do." After getting her new hip in November 2006, Korgaokar could hike, ski and ride horses around her Denver home free of pain. "I wish I'd done it much earlier, because it completely changed my life," said Korgaokar. But her life soon changed again, when she received a letter last fall stating that her hip was being "voluntarily recalled." "I thought: that's what happens to cars," Korgaokar said. "It just really seemed like a joke -- you don't recall parts you put in a person." It was no joke. Korgaokar's hip was being recalled because of a design flaw that her doctor said could leech chromium and cobalt into her body. "You put your faith in the doctor and the companies that make these products because they're the experts," Korgaokar said. "It's just beyond me to think that things can get approved that really don't work. It leaves me speechless." The approval process for medical devices has been the topic of growing scrutiny. Today, a study published in the Archives of Internal Medicine suggests most medical devices recalled for life-threatening or very serious hazards were cleared by the Food and Drug Administration through an expedited review process called 510(k), or were considered so "low risk" they were exempt from review entirely. "In my view, the regulatory system is failing," said Dr. Steven Nissen, a co-author of the study and chairman of cardiovascular medicine at the Cleveland Clinic. Nissen and colleagues examined the number of medical device recalls from 2005 to 2009 and determined which regulatory pathway they had taken -- 510(k) or the more rigorous premarket approval process. Of 113 recalls of devices determined by the FDA to cause serious health problems or death, 80 were cleared through 510(k), and eight were exempt from FDA regulation. "Some 80 percent or so of devices being recalled were actually never fully clinically tested in people," Nissen said. Marketing campaigns on TV and online hype the "new and improved products" directly to patients. "Since patients are exposed to new products through direct-to-patient marketing, they assume these products have been time-tested and well-established," said Dr. Andrew Pearle, an orthopedic surgeon at Hospital for Special Surgery in New York City. "But often there is little clinical data to support the marketing claims." If a device is shown to be substantially similar to one already on the market, the 510(k) pathway allows its makers to bypass the PMA pathway's rigorous preclinical testing and inspections. The tradeoff, experts say, is obvious. "If an existing technology can benefit from an upgrade, wouldn't more patients be potentially helped than harmed to get the product to market quickly?" said Dr. Cam Patterson, chief of cardiology at the University of North Carolina and director of the UNC McAllister Heart Institute. "But if a new defect is introduced at some point in the chain, from design to manufacturing to storage to delivery, the outcome for affected patients could be dire." For implantable devices, like Korgaokar's artificial hip or an artificial heart valve, a recall means an operation. "If you want to take back a heart valve you have to sit down with a patient and say, look, we have two very different, bad choices here. We can wait until your device fails, or we can go in and do an operation and put a new device in," Nissen said. "Those are very difficult choices." Korgaokar, now 41, had a second surgery in January to replace her recalled hip -- an ordeal she lamented. "The first time around, I knew it would hurt and I'd be scared and that it'd fix things that I wasn't able to do, and it did," Korgaokar said. "But the second time around, I knew how much it was going to hurt, so I wasn't really looking forward to it." Last week, the Sacramento-based law firm Kershaw, Cutter & Ratinoff LLP, filed a suit on Korgaokar's behalf to a supreme court in San Francisco. "She shouldn't have had to go through a second operation so soon," said Korgaokar's lawyer, Stuart Talley. "In her lifetime, she will have had to undergo an operation that she shouldn't have had." The firm is seeking compensation for Korgaokar's pain and suffering, as well as medical expenses and lost earnings for having to undergo unnecessary surgery. They also hope to recover any damages associated with the long-term effects of elevated chromium and cobalt in her blood, which are still under investigation. A spokeswoman for hip manufacturer DePuy Orthopaedics says the company's top priority is and always has been patient safety. "We understand that this recall is concerning for patients, their family members and surgeons," she said. "Since the recall decision was made, DePuy has worked to provide them with the information and support they need. DePuy is committed to addressing reasonable and customary costs of testing and treatment for reasons related to the recall, including revision surgery if necessary. DePuy will also pay for reasonable expenses related to receiving care, such as lost wages and travel costs." 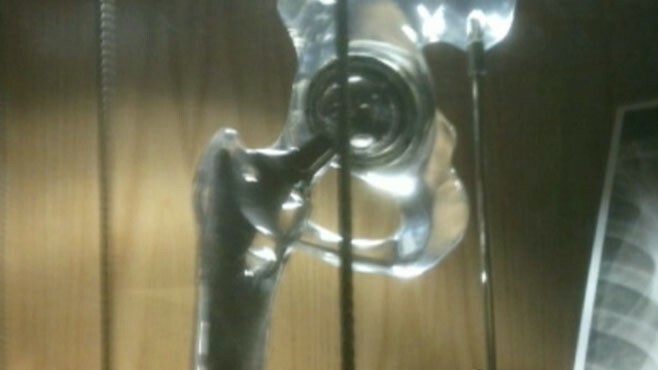 Roughly 93,000 people worldwide received the recalled hip. In September 2009, the FDA asked the Institute of Medicine to review the 510(k) process and simultaneously established two internal committees to make recommendations for improving the system. In August 2010, the internal committees suggested 55 changes to the process. But a plan announced in January detailed only 25. "They relate to the standards that we have, which happen to be the highest in the world," said a spokesperson for the FDA. "They relate to the monitoring of devices once they're on the market, where we've taken a comprehensive look at our program, and we're instituting changes to strengthen it." The FDA denies that Nissen's study reveals a crack in the system. "The devices that were evaluated via this program, over 19,000 of them serve the American public very well and they're safe. There are some occasional devices, for which we issue recalls or advisories. And that's appropriate," the spokesperson said. Korgaokar said she's angry with both the FDA and the hip manufacturer. "It's not right," Korgaokar said. "And it's just amazing to me that something that doesn't work properly gets approved." What Do You Do When Your Hip Is Recalled?